And here she is in her final setting. 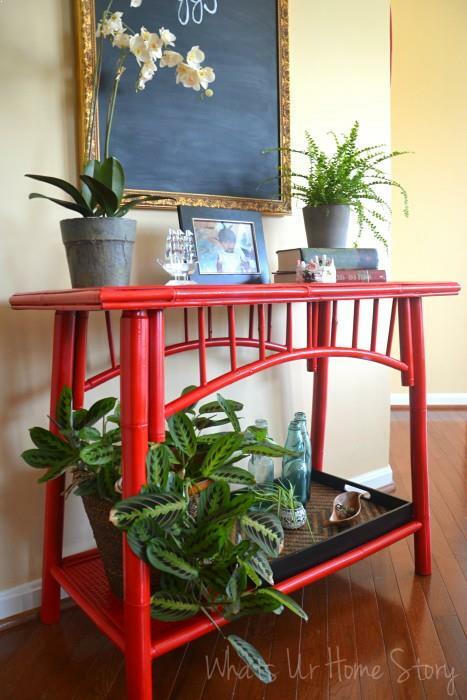 Wondering why you never saw this console table before? This is a fairly new piece of furniture (actually it has popped up once or twice on the breakfast table reveal post), one I bought with my birthday gift $. Bamboo furniture to me is pure nostalgia. Back from where I am from bamboo is easily available and as a result cane furniture is all too common. PS: If you are freaking out like B on the red then take my word for it, it all makes sense in the big picture. When I picked it up in a hurry during one of my umpteen trips to Ross ($50) I had no plans of painting it. Let alone keeping it. All I knew was that I wanted to use it as a plant stand in our breakfast idea. I brought it home and B promptly voiced his disapproval. We decided to ‘live with it’ for a few days and see whether it would grow on us. No surprise there, it did! The thought of painting it slowly evolved once we finished the breakfast room dining table. The dark walnut finish, the dark chairs, the floor, and then this table was way too much. I know you’re thinking, “Yeah…yeah….yeah… it is just another spray paint project”. Agreed but one that taught me a valuable lesson. When spray painting furniture always use a primer first and only then do an enamel coat. The “Paint + Primer” spray paint can just does not cut it unless you want to paint the piece white or black! I realized this after emptying almost 1.5 cans of Rustoleum Apple Red Paint + Primer. Not only did the paint blotch up in a few places it also was just not bright enough. You know that gloss apple red color? I had to sand down the blotched up areas and coat them in white primer twice. I also ended up priming the entire piece as I wanted the color to be even. So half a can of Rustoleum White Paint + Primer (that is the only primer I had on hand) and 3 cans of Rustoleum Apple Red Paint + Primer later we are here! Can’t wait to move it inside and style! Fingers crossed, hope to have the reveal by next week. I’ve read many posts online both for and against painting furniture, especially bamboo furniture. I think most of the bamboo pieces you see now a days in the US have a dated feel. Yet because of their interesting lines they are very sculptural and can make quite a strong statement when used cleverly. Painting them in a bright fun color instantly updates them and is like tacking a giant “Hey, Look at me” sign on them. Do you have bamboo furniture in your home? Are you for or against leaving it in its original stain? Have you tried spray painting bamboo furniture before? Update: See the finished reveal picture here. I have a bamboo/glass top breakfast table and chairs which were very expensive when purchased 30 years ago! It is still in great shape and used daily. Have always loved it, but so dated now! I really don’t want to get ride of it, but don’t know what to do with it. Decorator friend told me to paint, but I have seen some painted in a restaurant and the paint was peeling off. Did you sand the piece down before painting? Mine has a shine to the finish and I would think that would need to be sanded off first. I have a traditional home and kitchen is solid white. Updating kitchen soon and not sure of colors yet but will keep cabinets white. Accents are deep antique red, yellow golds and deep navy to cobalt blues. Any suggestions for a color to paint the table and kitchen walls – ceilings are very tall with exposed white beams? Thank you! Hope that helped. Do let me know if you need any other info. Good luck and do send in the after pictures. Would love to see your updated kitchen.